Harry (Anthony Edwards) finally finds the girl of his dreams (Mare Winningham). He's in love. But everything goes nuts one night, after he takes a phone call at a phone booth outside Julie's work (Johnnie's Diner). The phone call warns of the nuclear apocalypse heading toward LA. Harry has only few hours to evacuate. It's four in the morning and he needs to go get Julie. In the mean time, the crazy apocalypse story he tells causes chaos in a big scale. 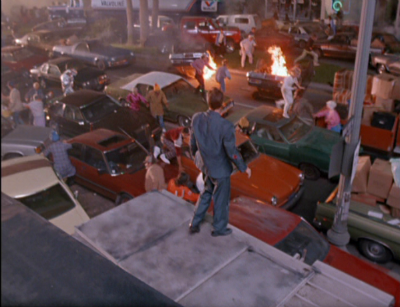 Miracle Mile has that unmistakable 80s LA spandex vibe mixed in with the tail end of the Cold War anxiety (The fall of Berlin Wall was still a year away). It features horrendous traffic jam and car pileup a la Week End. Harry slogs through all the chaos taking many unnecessary detours. "Are we gonna make it?" Julie asks for all mankind. "I think it's insects' turn." Harry answers. 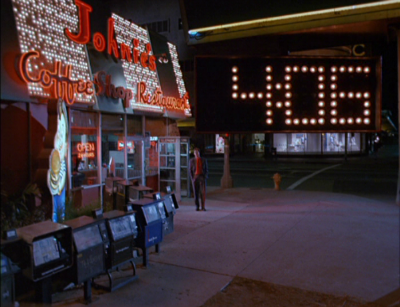 Miracle Mile lacks sense of desperation and suspense. But its raw energy makes up for it to be something special. Remake is in order?